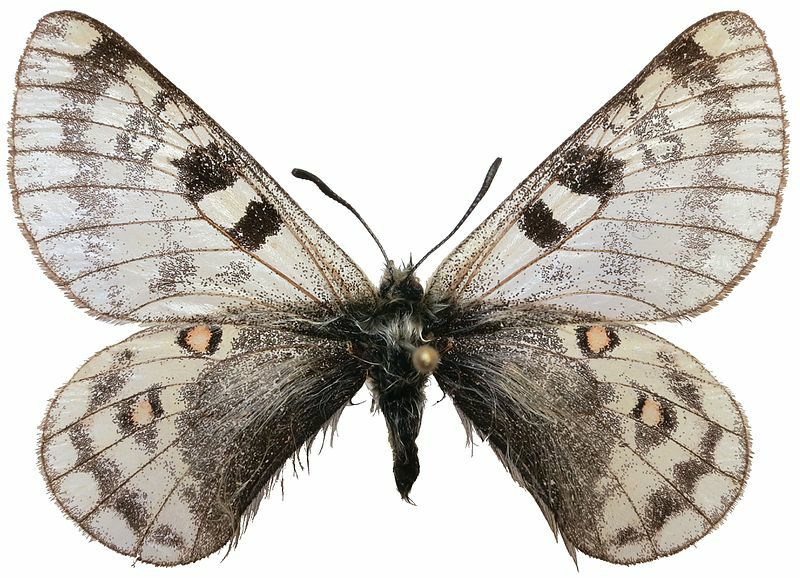 Parnassius simo Gray, : 76, pl. 12, fig. 3, 4. Description of adults (Bingham 1907): Wingspan: 48 - 50 mm. " . Upperside: dull white, the veins black. Fore wing at base and along the costal margin lightly irrorated with black scales; a black medial transverse bar with even parallel sides across the cell, and a broader black bar on the discocellulars, this latter with a more or less outwardly curved exterior edge; beyond this a bisinuate discal and an outwardly curved postdiscal transverse black band, both extended from the costa to vein 1; the discal band generally more or less obsolescent and ill-defined below veins 3 or 4, but well marked between veins 1 and 2; the outer edge of the postdiscal band with a tendency to be very narrowly continued outwards along the veins; terminal margin dusky subhyaline black, bounded by an anticiliary jet-black slender line; cilia dusky black. Hind wing: base and dorsum broadly and heavily shaded with black, sparsely covered with long recumbent white hairs that become fuscous along the extreme edge of the dorsum; the black occupies the basal half of the cell and extends along the lower margin of its apical half to base of vein 4, from whence it narrows and is carried obliquely down to near the tornal angle; beyond the cell there are two black-encircled red spots, one in interspace 5, the other in interspace 7; these are followed by a postdiscal, generally complete, curved series of black lunular marks and a narrow terminal dusky-black band, bounded by an anticiliary jet-black line as on the fore wing; cilia yellowish white. Underside: with the usual glassy appearance, the markings of the upperside showing through by transparency; the following, however, are marked more or less by actual scaling: the medial and apical black cellular bars on the fore wing; the red black-encircled spots on the hind wing, with three additional red spots outwardly margined with black at the base of the same wing, the posterior two of these basal red spots are large and somewhat pear-shaped. Antennae, head, thorax and abdomen black; the head above fuscous; beneath: the palpi, thorax and abdomen with dusky fuscous pubescence, mixed on the thorax and abdomen with long white hairs. - . Similar, but in the specimen in the collection of the British Museum marked as the type, on the upperside of the hind wing the red in the discal spot in interspace 5 has disappeared, the same colour in the spot in interspace 7 is reduced to a minute speck, and on the underside the middle red spot of the basal three only is present, much reduced in size. 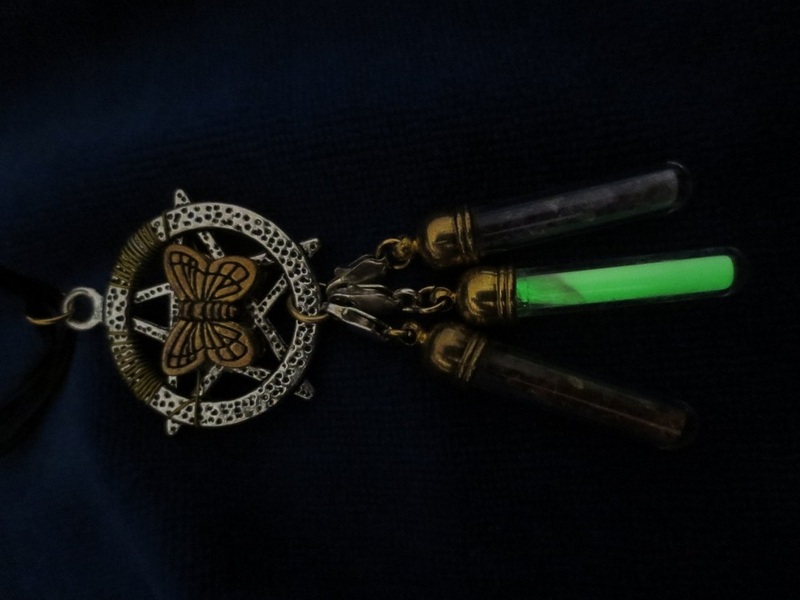 Antennae, head, thorax and abdomen as in the ." The species is known from Bhutan, China, India, Kyrgyzstan, Nepal, Pakistan and Tajikistan (Häuser et al. 2005), where it has been found around a height of 16000 feet (appr. 5000 m a.s.l., Bingham 1907). Gray, J. E. 1852 . Catalogue of the Lepidopterous Insects in the Collection of the British Museum. 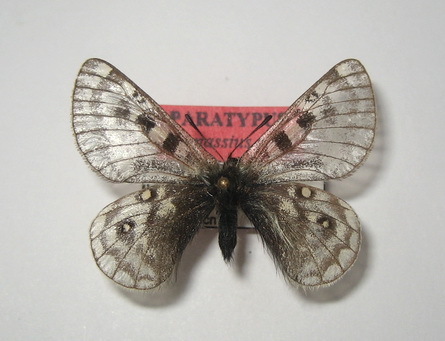 Part I. Papilionidae. Taylor & Francis, London, 81 pp., 15 pl.